Filled with feeling but also a little too lighthearted for its own good, Infinitely Polar Bear does much to make you like it, but maybe a harsher perspective would have helped. 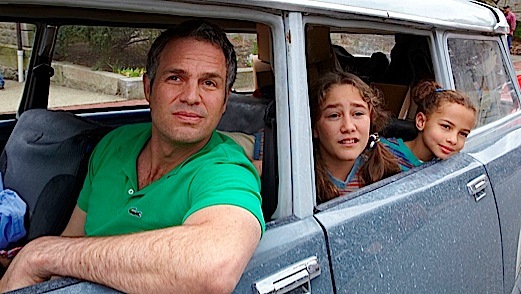 Playing a manic-depressive father who has to care for his two young girls, Mark Ruffalo mostly cuts through standard disease-of-the-week platitudes. But writer-director Maya Forbes’s gentle drama frustratingly stays on the surface of the issues that engage it. Set in the late 1970s in Boston, Infinitely Polar Bear concerns the Stuart family, led by parents Cameron (Ruffalo) and Maggie (Zoe Saldana). Diagnosed as manic-depressive, Cameron tries not to let his condition affect him, which is difficult since he can’t hold down a job, is prone to flying off the handle, and sometimes has full-blown breakdowns. His most recent crackup gets him arrested and institutionalized, leaving Maggie convinced that she has to become the head of the household. Enrolling in grad school for business in New York to help pull the family out of their lower-class status, Maggie realizes that she can’t bring the children, Faith (Ashley Aufderheide) and Amelia (Imogene Wolodarsky), with her. This leaves only one option: The newly released Cameron will have to watch their kids while she’s away at school. The burden of the responsibility seems too much for him, but what choice do they have? Forbes should be commended for making a movie about mental illness that doesn’t base its entire narrative on touchy-feely observations about those with the disease. Cameron is treated matter-of-factly, but unfortunately the movie can’t resist a certain amount of cutesiness when it comes to his character. Still, Ruffalo plays him with bullheaded intensity—Cameron knows he’s sick, but he’s convinced that he’s more stable than people assume—and the movie gets its strength from the way that Cameron’s worldview isn’t shared by the movie. He’s his own island—poignantly so. The filmmaker, who was an executive producer on The Larry Sanders Show and a writer on The Rocker and Monsters Vs. Aliens, has based Infinitely Polar Bear on her own childhood, and one recognizes that it must not have been an easy one. Being raised by a bipolar father, living in poverty, having mixed-race parents at a time when such marriages were less embraced by society, Forbes faced her share of hardships, but Infinitely Polar Bear doesn’t try to make the children Angela’s Ashes-style martyrs. Instead, there’s a lot of life and love in Forbes’s reminiscences—a warmth that suggests that no matter how hard it was at the time, she has the distance now to forgive. But maybe she’s also pulling her punches. One watches Infinitely Polar Bear and wonders if it was all quite as wistfully challenging as it plays out here. There’s a darkness on the edge of Ruffalo’s performance, but Cameron’s torment is mostly portrayed as a darned nuisance, rarely hinting at the serious ailment that would make Maggie so concerned about leaving her children in his care. With that said, Forbes’s affection for these characters rubs off on the viewer. The film doesn’t bear the sting of poverty that fills every frame of a Sunlight Jr., but it’s wise about the rather remarkable age this family was living through. Unknowingly, the Stuarts are gender-role trailblazers, boasting a mother who will be the main breadwinner and a father who stays at home with the kids. Forbes lived through it, and it’s her prerogative how she wants to tell her story. But in her insistence on finding the happy ending, Infinitely Polar Bear doesn’t find enough of the sadness and pain that would have made such a conclusion earned.